UML Diagram Maker is a cross-platform uml diagram and ERD design program which is compatible with Mac OS X, Windows and Linux systems. 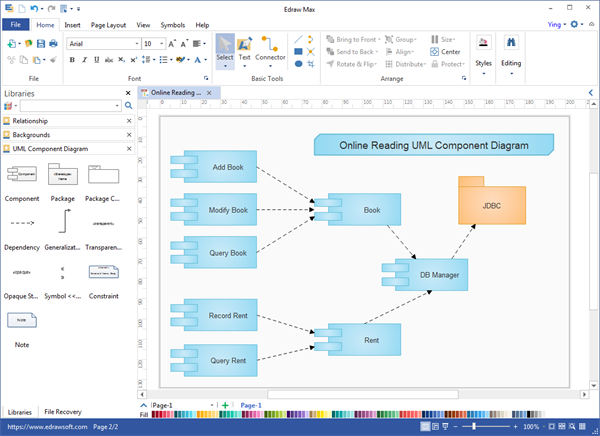 UML Diagram Maker is a powerful yet easy-to-use UML diagram drawing program which makes it easy to create professional-looking UML diagrams with built-in symbols and templates. Easy to make UML sequence diagram, use case diagram, UML class diagram, UML activity diagram, UML deployment diagram and more.Edraw UML diagram software, which has already done greatly on Windows, finally released its Mac version, and many features have been advanced. It is a great UML diagram Visio alternative for Mac OS, which doesn\'t cost much. Download a trial version now to see its abundent resources and experience its powerful capabilities. You will like it. Pretty Good Solitaire Mac Edition is a collection of 500 solitaire games for Mac OS X. It features lush graphics, beautiful easy-to-read cards, sound, in-depth statistics, and quick click smart move. Games include Klondike, FreeCell, and Spider. iCoolsoft Flip Converter for Mac enables you to convert Flip HD video to mainstream video and audio formats supported by varieties of portable players on Mac, like converting Flip video to WMV on Mac, convert Flip video to AVI, ASF, 3GP, SWF, FLV.